Dave Rowe--keyboards, 6-string guitar, tuba, bass vocal on "Nighty Night"
All songs copyright 1997 Outer Green Music Co. ASCAP except as noted. educators Jeff and Deb Sandler, "Mr. and Mrs. Fish." Than the things that you think you might see. With my ocean friends and me. And driftwood washed up on the shore. And sand dollars there by the score. So let's all lend a hand. For my ocean friends and me. Tommy Makem. We added the Boston and Portland verses. Now was you ever in Quebec? Hey ho and away we go. Now was you ever in Halifax town? Now was you ever in Boston Bay? Was you ever in Merrimishee? Was you ever in Baltimore? Now was you ever in Casco Bay? the horses in its tempo. And tend and feed the plough team that stands so still and proud. And yoke them to the ploughshare and leave the farm behind. And the sun at the break of day. His hands are sore and callused, he keeps them straight in line. His eye is sure and steady, his team well matched and fine. The open sky above him with gulls for company. And with God's help and sunlight the seeds shall surely grow. A bushel for the springtime to sow the fields again. And now the yokin's over; the hard day's work is done. The horses are but shadows in the waning of the sun. And early he must rise again and to ploughing come once more. attributed to Sir Harold Bolton. maritime songs. Most likely the melody goes back to the British Isles. I'se the b'y that catches the fish and takes 'em home to Liza. Hip your partner, Sally Tiboo, hip your partner, Sally Brown. Fogo, Twillingate, Morton's Harbor, all around the circle. That's no good for winter. This one was penned by Tom for yet another "Mr. and Mrs. Fish"
television show and video entitled "The Treasure in the Eel's Cave." Chuck played several character roles in the production. And then I'd wish for you to be the crew. We'd look for booty, gold and ships of pleasure. And make up maps to find our sunken treasure. We'll find a place of many mysteries. When we search for sunken treasure at the bottom of the sea. If you believe that wishes can come true. We'll have some fun and learn a few things too. And some people that you've never met before. Sing it well and we'll be off to the ocean floor. Scritch, scratch, scratchin' at the door. Then let him out again once more. He wants to come in. He wants to go out. I guess he forgot where he was just a minute before. He wants to come in again. He wants to go out once more. He's always on the wrong side of the door. Can you hear him meowing at the front door? It's OK to leave it open just a crack. Then diddly bop boppin' out the back. He can pass up a tasty meal, there's nothing to it. But when he sees an open door, he's got to go through it. Lollygaggin' on the welcome mat. Alberta. Many thanks to Principal Johnny Worrell for this version. I like to eat my apples and bananas. 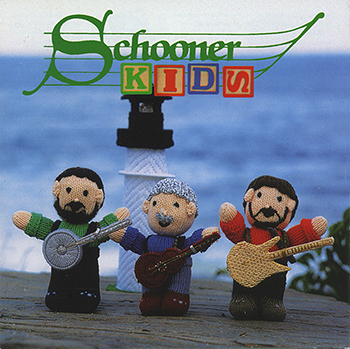 Schooner Fare originals that predates the group. And take the time to teach your children to sing. And as you teach them, they will teach you, we're all teachers in a way. Take a lesson from the piper, kids choose music every time. That gives us all our own good reason to sing. They'll be much less apt to quarrel when a song is on their minds. Take the time to teach our children to sing. a Hole in the Bottom of the Sea" and "The Twelve Days of Christmas." of its own and actual adults have been known to practice it. This is the first song Charlie Romanoff taught each of his five kids to play on the ukelele. And we'll sing a serenade to a pretty monkey maid. And up in a tree a chimpanzee sings merrily. Way down in Jungle Town. and son Dave provide the bass voices. Because the Lord has willed it so. For I know that I've lost another baby day. The sand man comes to close your eyes.